Alpha Delta Pi conventions are the supreme governing body of the sorority. 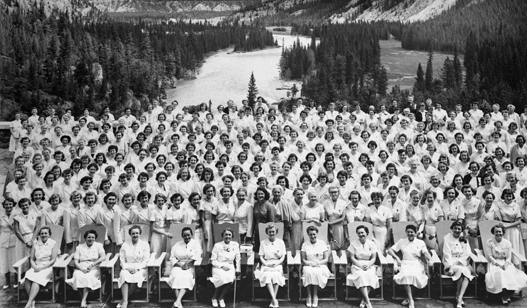 Every other summer, in odd numbered years, the convention delegation, assembled of alumnae and collegiate members, gathers together for fun and sisterhood, and more importantly, sorority business. The first convention was assembled in 1906 in Macon, Georgia. Conventions are steeped in tradition. 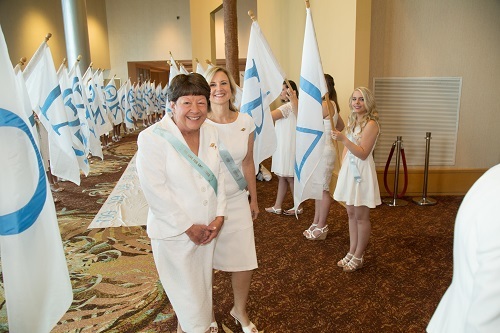 To open convention, sisters march in the Adelphean Processional, with everyone marching into the opening session wearing white dresses and blue ribands bearing our motto, “We Live for Each Other.” At the very first convention, a series of meaningful toasts were offered and since then, silver toasting cups are raised by the delegates at each convention. At the final banquet, delegates rise to the chapter roll call, then sing Alpha Delta Pi songs in a candlelight recessional as the traditional convention closing.